Still in a Christmas-y mood. Simple. Pretty. Sparkly. I like it! For more takes on this sketch, visit Beate, Charmaine, Laurie, Lori, Mary Jo, & Sharon! It’s always such a delight to see what these fabulous ladies have come up with! Focal Image is Postmodern Design (PL4-106-D) and I picked it up at my local stamp store the other day. I need the Peace one, and really regret not buying it! I guess I’ll have to go back there, huh? It’s stamped with Ranger Distress ink in Walnut Stain, I think. Winter Wonder Snowflakes from Verve Visual are stamped in Cool Caribbean and Glue Pad for some sparkle and to echo the patterned paper’s design. Paper is shimmery Poison Ivory and Basic Grey’s Figgy Pudding. Chipboard snowflake is Cosmo Cricket, and the iridescent sequins on top are secured with a clear rhinestone brad. Ribbon is luscious May Arts. Glitter, Martha Stewart and Dazzling Diamonds. The overlapping panel is tucked under the chipboard snowflake. Want to get in the mood, too? Take a gander at Harry Connick, Jr. singing “When My Heart Finds Christmas” . . . swoon! such a lovely card Jenn! that ribbon is divine!! GORGEOUS Jenn! LOVE those colors! Oh My Goodness! This is GORGEOUS! I love all the sparkle, the paper and the stamps you chose. I told you I NEED new rubber and this is not helping! You are such an amazing artist. You dazzle me every time! This is so beautiful! I love the unexpected colors, the glitz..the sentiment…. Just beautiful, Balcer! I love this ribbon!! And your card is so soft and sprakly. I adore it! Stunning! Yep, we must have been feelin’ the same color combo this week:) But, it is an awesome combo and you did a great job with it. Love it! Gorgeous, Jenn — great colors and I love that paper! 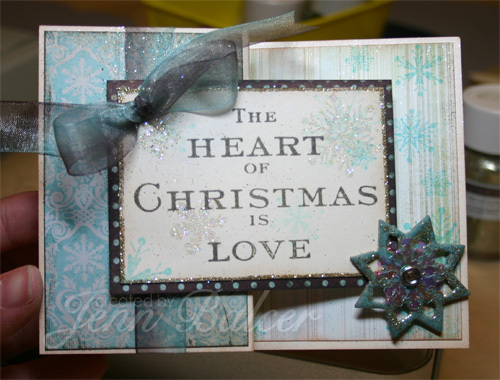 The stamped snowflakes go so well with the paper and sentiment (which is wonderful). That beautiful ribbon is the perfect touch (we were both on a loopy bow wavelength today)! you card is awesome. Love your watercoloring on the other card (Santa). Just beautiful. Love your card. And we’re on the same page about Harry Connick, Jr. My son graduated from Tulane University in New Orleans and stood next to Harry and his family at one of the Mardi Gras parades. Now, why couldn’t that have been me?????? And did he even think to ask for an autograph? BTW, I’m just up the interstate from you at Ft. Hood. The weather is fabulous right now. Loving this weather….but lovin this card even more….simply stunning—LOVE the sparkle! Oh, these colors are sooooo pretty!! That DP is just divine…as are the sparkly snowflakes!!! Jenn, this is just gorgeous! I love all the sparkles!! Gorgeous! Jenn, stay in the Christmas mood. It’s almost here, you know, and I’m loving what I see. Fabulous card! Love the colors and the whole feel to it! And I agree, the weather this week in Texas has been the best!! Love getting the hot chocolate out again! This is just gorgeous! I love the colors of the Figgy paper and that ribbon is just lucious! I gotta get some of that! Yummy!!! EYE CANDY!!! love all your bling and sparkle! Your card is absolutely stunning! I love, love, love it!!! I love the shimmery colors, patterned paper and bow—it’s so beautiful! OOOOOO AHHHHHHHH Jenn!! Just gorgeous!! I need to make a run to Daisys (eP) house and get my Figgy Puddin’ order!! I want it!! !